Latest data by IEA shows that in 2015, global carbon dioxide emissions remained flat, for second year in a row. This is largely due to an increase in the use of renewable energy, and a decline in emissions by China and the U.S. However, emissions by many developing Asian economies, the Middle East, and some countries in Europe have continued to increase, according to the IEA. For several decades, growth in global economy has been linked to an increase in global carbon dioxide emissions. Last year though, the International Energy Agency (IEA) reported that carbon dioxide emissions in 2014 had remained unchanged from 2013. This was despite a 3.4 percent growth in global GDP (Gross Domestic Product) that year, the IEA reported. 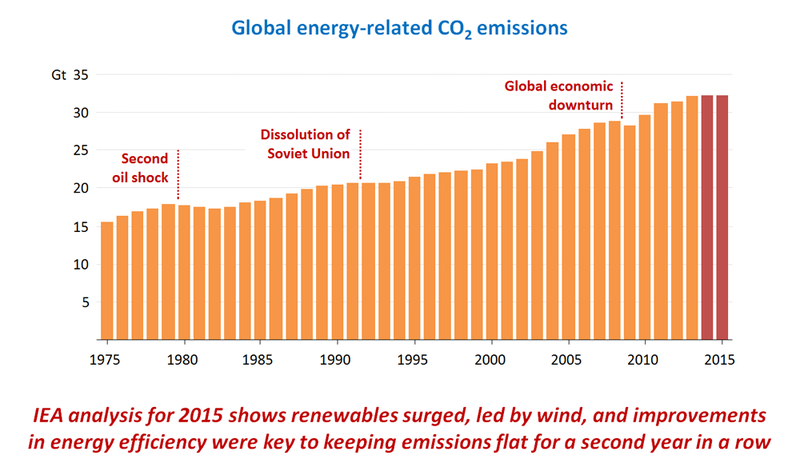 Latest data by IEA shows that in 2015 too, carbon dioxide emissions remained flat. While global economy in 2015 grew by 3.1 percent, global emissions stood at 32.1 billion metric tons, close to 32.3 billion metric tons in 2014. This suggests that emissions may have “decoupled” from economic growth, the IEA reported. According to the IEA, surge in renewables was largely responsible for keeping emissions the same as 2013. Graph from International Energy Agency. According to the IEA’s preliminary data, this “decoupling” is largely due to an increase in the use of renewable energy. Renewables — mostly wind — accounted for about 90 percent of all new electricity generation in 2015, IEA’s press release said. Reduction of emissions by China and the United States in 2015 also contributed to the emissions staying flat, IEA said. China’s decline in emissions is mostly due to decreased dependency on coal. According to the IEA, less than 70 percent of the country’s electricity in 2015 was generated from coal, while that from low-carbon sources, including hydro and wind, increased to 28 percent from 19 percent in 2014. Overall, China’s emissions appear to have declined by 1.5 percent. Emissions in the United States, too, seem to have declined by 2 percent, mostly due to switch from coal to natural gas, IEA said. At the same time, emissions in many developing Asian economies, the Middle East, and some countries in Europe continued to increase, IEA’s preliminary data suggests.